• Easy to Use >> It's extremely easy to convert a DVD for specific file types and devices. All you need to do is load your disc into the application; select the file format, device or service from the library; and start the rip. • Great Ripping Attributes >> EaseFab DVD Ripper makes a balance among fast ripping conversion speed, excellent output video audio quality and a manageable file size. • Amazing Customization Tools >> It allows you to adjust technical aspects of videos, such as codecs, aspect ratios, bit rates, frame rates and more, before you rip discs. Besides that, it includes a basic video editor you can use to trim away unwanted footage, crop video, add watermarks, etc. EaseFab DVD Ripper for Mac supports most of the popular DVD movies and is upgraded regularly. It is the best DVD ripper on Mountain Lion and Mavericks to rip and convert any DVDs. EaseFab DVD Ripper for Mac is an all-in-one DVD converter for Mac that lets you rip and convert DVD to any prevailed video and audio formats bypassing DVD copy protection. 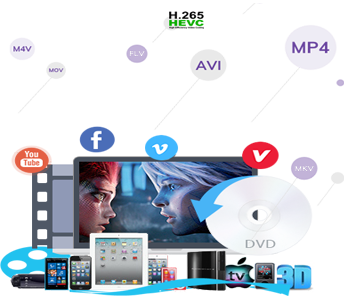 High speed and excellent conversion quality let you enjoy your favorite DVD movies wherever and whenever you want. With this DVD ripper Mac software, you can easily convert any DVD movies to all popular SD and HD video formats like AVI, MP4, H.265/HEVC, WMV, MOV, FLV, MKV, 3GP, MPEG, TP, TRP, HD AVI, HD WMV, HD MOV, etc and any devices playable formats. It provides presets for iPhone X, iPhone XR, iPhone 8, iPad Air, iPad Pro, Apple TV, Samsung Galaxy S5, Galaxy Note 4, PSP, PS3, PS4, Xbox 360, Xbox One, Zune, Archos, Sandisk, iRiver, Creative Zen, PMP, MP3 Player, Android smartphones, tablets and more. Moreover, it adds some advanced encoders like Apple Intermediate Codec, ProRes and DNxHD, allowing you to convert DVD to seamlessly fit iMovie, iDVD, Final Cut Pro, Avid, etc. This Mac DVD Ripping tool also offers enough freedom for all DVD movie lovers like you to back up your favorite DVD movies in a personalized way. Three different copy modes: Main movie, Full Disc Copy and Customized movies are provided to let you copy the exact movie part you want. With it, you can effortlessly keep your DVD discs from scratched, damaged, or manage your movies in more convenient way!